Update: The UK has also announced an electronics ban, with a longer list of airlines including British Airways. What started off as a tweet by the Royal Jordanian Airlines last night has since then become the talk of the town for the whole of today. The United States has instructed nine Middle Eastern and African airlines to stop passengers from bringing most types of electronic devices into the cabin for U.S. bound flights. Instead, they’ll have to check them in. Since this is going to affect almost all passengers from Asia and Indians in particular, I decided to do a little bit of research and answer questions that have been coming up since morning. Which are the airlines that have been affected by this electronics ban? Instead of mentioning airlines, the TSA have mentioned that airlines “originating” from certain cities have to comply with this electronics ban. The cities are Amman, Abu Dhabi, Cairo, Casablanca, Dubai, Doha, Istanbul, Jeddah, Kuwait City and Riyadh. This basically translates to the following airlines. Yes, the electronics ban list includes the big 3 of the Middle East. What is the reason for this electronics ban? U.S. officials are saying that the move is due to a suspicion that terror groups may target passenger planes by smuggling explosive devices in consumer goods. There are also a few rumours that this is due to the lobbying of Delta/United/American airlines. The US carriers have been complaining about Emirates, Etihad and Qatar Airways for quite some time now, and Trump had promised to help them as recent as last month. Is this electronics ban effective immediately? Emirates has announced that this ban will be in effect for flights starting from Dubai from Friday onwards. The Department of Homeland Security has given the airline companies 96 hours to comply with this ban, starting from March 21, 2017, 3AM EST. Apart from smartphones and medical devices (that are required during travel, will be scanned separately), all other electronic devices such as power banks, e-readers (Kindle, iPad), laptops, cameras, gaming devices etc are banned in cabin luggage. You can, however, check-in all of these, at your own risk (of theft). How long is this electronics ban going to last? As of now, this ban is indefinite as far as the above-listed airlines are concerned. If an airline doesn’t comply with this ban, the FAA will pull their certificate and they will not be allowed to fly to the United States. 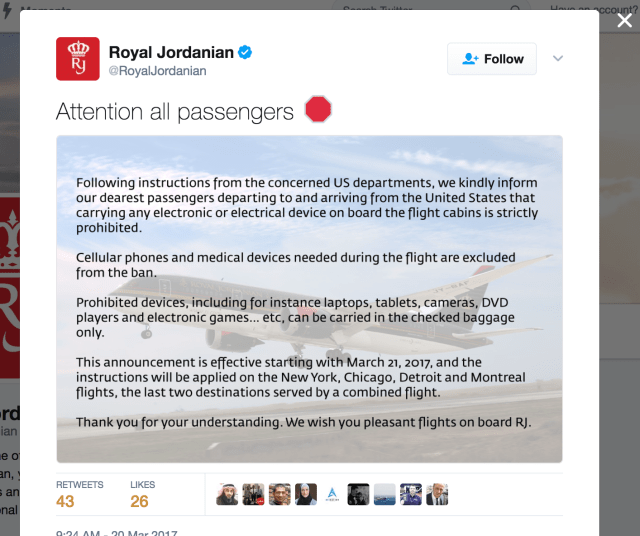 Do the affected airlines have any say as far as this electronics ban is concerned? Sadly, no. They have no choice but to comply, and most if not all airlines have come out with press releases conveying the same. But, isn’t it risky to put electronic devices in checked baggage? We have been long instructed by airline companies, safety experts and other regulators that batteries shipped in bulk may constitute a fire risk, which is why at least in India and in most parts of Asia, we are instructed to carry our camera and more importantly, the power bank along with us as a part of our cabin luggage. Airlines in India have rules stating that you can’t carry electronic items with batteries in your checked-in baggage, and this rule is exactly the opposite. Many flyers are going to face trouble, especially those who have booked tickets already. Watch out folks.